Well, the dust has settled, the guests and attendees have gone home, and the concom have stopped twitching! After we have all had a rest, and tidied up the loose ends we'll be sending out the post-con reports with all the final details. We hope to be able to announce some of the auction items soon. There are some rare pieces, including a few legitimate items from The Lord of the Rings. Stay tuned! We can show you a very special item for sale. 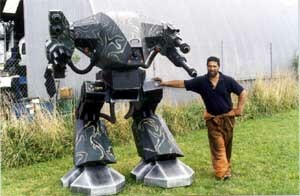 A while back for various reasons, Eddie Longley built a large mech. It stands about 2.5 meters high and looks like the real thing! Also for sale is an XMEN personalised license plate for your vehicle. The nominees have been anounced! Go to the Fan Awards page to see who they are. You can also download some examples of their work. The OdysseyCon website has been updated with the 'final' events schedule. The OdysseyCon website has been updated with more information about new guests. We also now have a preliminary schedule for the convention on the website. Please have a look in the events section, and let us know if you can see any potential problems. The OdysseyCon website has been updated with more information about our guests, and final pricing for the hotel and the banquet. The New Zealand Fan Database was used and expanded for ConQuest 2. ConQuest 2 may be over, but the fan database is very much alive. If you are interested in being on this database, please contact us at enquiries@sffanz.sf.org.nz. This database is only used for science fiction and fantasy conventions and there are strict rules when using the data, in order to respect your privacy. We have a full statement of such policies if you are interested in being in this database.